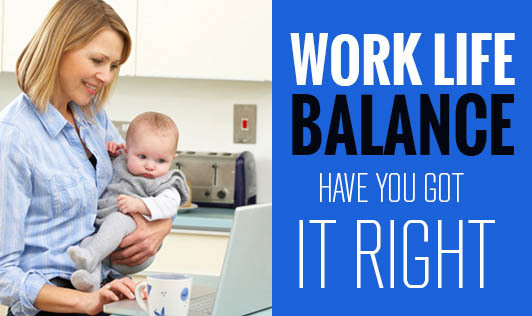 Work-Life Balance: Have you got it right? A significant source of stress for working men and women concerns the conflict between balancing career and family roles. We all need a certain amount of pressure in our lives. However, when we are too stressed we are less effective and efficient and tend to procrastinate more, leading to less available time and yet more stress. A poor work-life balance can lead to conflict, anxiety, irritability, or even depression. Working long hours or shifts that can make it difficult to see your friends and family. Working from home may be merging the boundaries between where work stops and home life begins. Travelling long distances during your working days. Working in a stressful or confrontational environment can have a significant impact on how you cope on a day-to-day basis. For your own physical and psychological wellbeing and to maintain good relationships with family, friends, and colleagues, it is important to find a sense of balance that is right for you. Take time to consider you priorities at home and at work and then plan ahead. Delegate at work whenever possible. Set realistic and achievable targets for yourself. Remember to reward yourself for your achievements. Make Work-Life Balance your goal and be focussed towards it. It will be more rewarding in the long run.